[For VM backup copy jobs only] Veeam Backup & Replication connects to Microsoft Hyper-V hosts to gather information about VMs whose restore points you want to copy. For backup copying process, Veeam Backup & Replication starts two Veeam Data Movers — source Veeam Data Mover and target Veeam Data Mover. 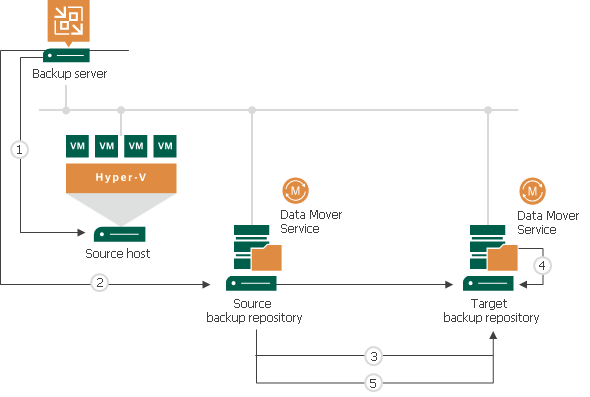 Veeam Data Movers location depends on the backup repository type and data transport path. For more information, see Backup Copy Architecture. The first backup copy interval of the backup copy job always produces a full backup file. Veeam Backup & Replication copies data blocks that are necessary to build a full backup of a machine as of the most recent state. Veeam Backup & Replication can copy data blocks from one or more backup files in the backup chain on the source backup repository. If the backup chain is created in the reverse incremental backup method, Veeam Backup & Replication copies data blocks of the latest full backup. If the backup chain is created in the forward or forever forward incremental backup method, Veeam Backup & Replication copies data blocks from the first full backup and a set of incremental backups. To minimize the amount of traffic going over the network, Veeam Backup & Replication uses the data compression and deduplication technologies. Veeam Backup & Replication transports copied data to the target backup repository and writes all copied data blocks to the full backup file. If you do not enable the Use per-VM backup files option for the target backup repository, Veeam Backup & Replication creates one backup file on the target backup repository and stores to it data for all machines processed by the job. If you enable the Use per-VM backup files option, data of every machine in the job is stored to separate backup files on the target backup repository. During every next backup copy interval, when a new restore point appears on the source backup repository, Veeam Backup & Replication copies incremental changes from this most recent restore point and transfers them to the target backup repository. Veeam Backup & Replication writes the copied data blocks to the incremental backup file on the target backup repository.